I come from Suburbia. This is a big deal. This was a post I wrote about a week ago. And was too lazy to draw for it, so here's the post anyway. If you know me, and well, I guess you'll get to know me more now - I'm a "Suburban Princess". Big cities scare me, as do places with like 3 houses within a mile distance. I like my cozy suburbia. It's nice. However, it means I haven't witnessed a lot of the world just yet, so weird stuff makes me all crazy excited. Today I saw a tumbleweed. 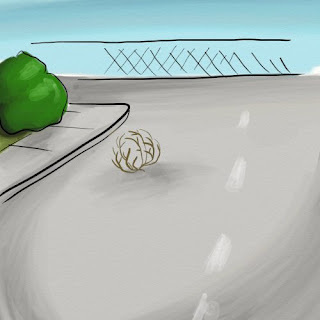 I was coming back from lunch today (yes I worked today) with my good friend TrishStuff, and we turned down a back street to get back to the store, when LO AND BEHOLD, there was a tumbleweed. Not off to the side, but in the middle of the road. Tumbling it's little heart out. It stopped as we approached with the car as if to say to us "Come at me bro!" and wave its little weedy arms at us. Whereas inside the car, I was FREAKING THE CRAP OUT. I was all "OH MAN! Is that a tumbleweed? Seriously?! Where did it come from!? That's SO COOL!!" and then promptly regretted not carrying a camera with me. Note to self: Buy a small camera to keep in a purse. It rolled off to the side, and we continued down the road, and got back to work. To which I could not stop talking about it all day. Either that, or drink less caffeine. I talked to Dave about it, raving that I saw this cute little tumbleweed. Dave: "Well, why didn't you pick it up and take it with you?" Me: "BUT IT WAS IN THE ROAD. Wait. You mean you would be okay if I brought home a random tumbleweed?" Dave: "Yeah. You've done stranger things." Me: "Oh. Hrm. Well next time I see one, I'm gonna pick it up, and we can keep it in the garage. Like a pet." Dave: "Whatever floats your boat." I will name it Ted. Since I was working at a booth, I don't get out too much to see things and take pictures. 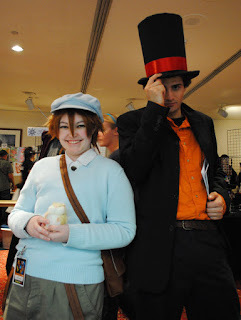 So here's some pics of some awesome people who I saw while I was selling my wares! I was visited by Giovanni, Blaine, Sabrina, Koga, and Brock. I was honored they each bought their respective badges! 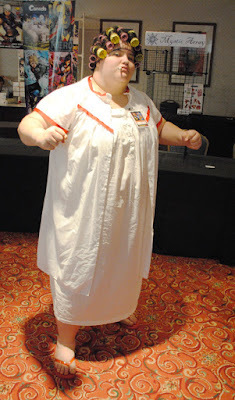 The Angry Landlady from Kung Fu Hustle. Seriously, I see so much obscure stuff like this. My favorite class in Final Fantasy Tactics!! I'm sorry, other person, I'm not sure who you were. Please let me know so I can put it here! I will take all pictures of all Laytons and Lukes. 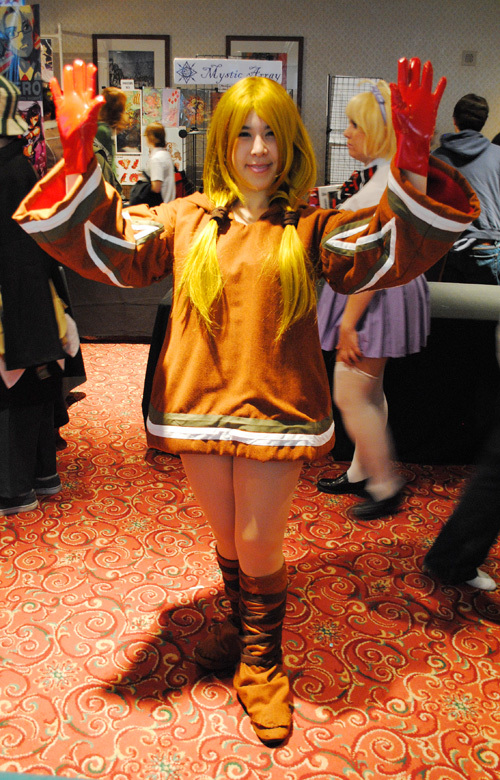 There needs to be more Wild Arms Cosplay in the world. I should see to this. 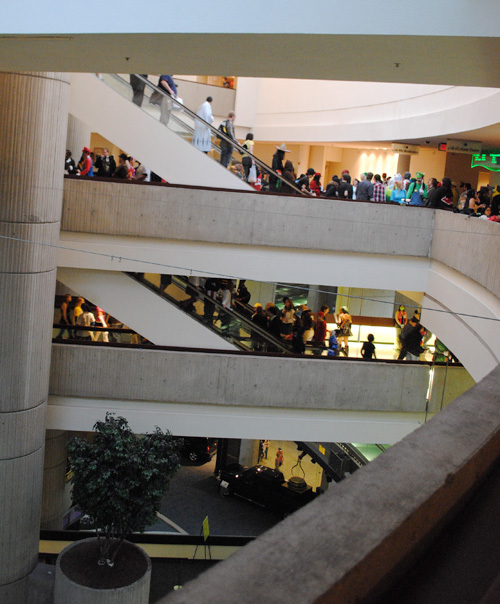 Youmacon Report #2 - It's Finally Here! Now that I've recovered from the hurricane that Youmacon was, I can provide you guys a decent report now! Friday was pretty much a blur for me. I spent a lot of it up in the room (Sorry to those who visited for badges I would have loved to say hi) I'm still learning how to do costume commissions for other people, so I'm a bit rocky at it at the time. So naturally I didn't plan things out for myself well and the last free time I had set aside to finish the costume (as well as finally the time fabric and my machine weren't trying to die), I ended up getting sick for 3 days and couldn't move much. Couple that with 40-hour workweeks, and I run out of time. I'm getting better at it though! We got into the Rencen at a pretty early time, did some searching, found the Alley wasn't open for set up yet, so we checked into our room. In trying to get up to our room, we were met with signs indicating that we could only get onto the elevator on floor 3. I WAS SO HAPPY. Why you ask? Well you see, last year it took us approximately at least 45 minutes to get an elevator to get up to our room. ALL DAY. What this did was provide an organized manner to get people up the elevators. No more shoving, no more cutting in line. It was amazing. Our wire frames were too big to fit up the escalators. Naturally being in good spirits, and not letting a little mishap get me down, I went searching for a staff member. After going in about 3 circles cause I can't see over a lot of people in costume, I found a LOVELY registration staff member. I wish I had gotten her badge name cause she was awesome. We explained our situation, and she was determined to get us upstairs even if we had to carry it part by part. She took us to the elevators and we found out that the all the 4th floor buttons had been deactivated and her card wasn't working. SO we continued our quest to the dealer hall/game room area because they needed to use elevators there and there CERTAINLY must be something there. After a few roundabout travels, we were brought through the game room to the back of it. Which is actually the first time in 6 years I've ever been in Youma's game room. It was really nice looking, and had I not been getting claustrophobic vending I might have spent some time in there. They led us to the back and LO AND BEHOLD and elevator was there. The freight elevator. One of those ones you see in those survival horror games with the doors plus some sort of chainlink fence door and big clanky buttons and big enough to put a truckbed in. Yeah. Those elevators. So they took us up there, we ended up being behind main events, and traveled out to the alley. It was quite the adventure, and was pretty entertaining. So THANK YOU ELEVATOR STAFF MEMBER! Anyway, we got up and ended up waiting in line, and after hearing some convoluted things about registration - managed to get lucky and got a table on the outside ring - the ones with the backs to the center area. Which is great. Because of the lower ceilings and wall to wall people, I've had a problem with getting claustrophobia induced anxiety attacks. Having that open back is a LIFESAVER. We set up, and then I vanished upstairs all day to work. Which I did and was successful. I brought down the finished commission, and I also dressed up as F'lhammin on Saturday. Business was SO CRAZY BUSY that after about 3 hours I said "SCREW THIS" and ran upstairs and changed. THANK YOU ELEVATOR QUEUE LINE. "Tohru... You will... make me a sandwich!" Having little amounts of sleep, I didn't move much from the table. Took some commissions, and then attempted to venture into the Dealer Hall. Which was a terrible idea. Remember that claustrophobia problem I mentioned earlier? Well I've never had a problem navigating crowds (I've been to Disney on 4th of july where it's full of INTERNATIONAL TOURISTS and their groups), Anime crowds react different to me. I think it's all the random stopping that just ticks me off, and then I'm also usually dressed up, trying to keep my badge on me, and getting shoved around. Needless to say it causes me to have anxiety and I fled before I got a good look at anything. I spent the rest of the day working on commissions, and selling things. For those not believing me, I took these pics around 6 pm on Saturday Night. 6 PM!! I guess they're headed to the Masquerade? Hmm? Around 6:30 our lack of sleep caught up with us, and we packed up and went upstairs. Where I proceeded to watch all 3 Back to the Future movies cause it was on TV in a marathon sequence. ....It was the first time I had truly "rested" in probably 3 months. It was weird. I had intended to cosplay on Sunday. I had wanted to wear ShortHair!Luke, however, we ran into a problem: I had no black undershirt. And with it being a belly baring coat, well... let's just say it would be kind of indecent to only walk around in my chest binder. So that was out. I was tired anyway. We packed up, and took a look at the little receipt telling us how to check out. I was worried I'd have to go wait in a long long line cause I slept in a bit. WELL FEAR NO MORE. Since I had put the room on my card, all I had to do was call in to the number provided, give my name and room number, and leave the keys in the room. That was it. HOW AWESOME IS THAT. I didn't even have to wait in a line. I left a lovely tip for the maid service cause they did such a nice job, and we headed out, put stuff in the car and then sat at the booth for several hours. I spent the time catching up on the last couple of commissions. I also spent some time finally getting to go into the dealer hall and wandering the Alley. I found art books, some T-shirts, got a couple of wigs I'm planning on working with, and much to my delight - I got to see the Creator/Writer/Artist of Dominic Deegan! I'm a long time reader, and I was super excited to be able to shake his hand and tell him he's awesome. I only hope that I'm able to draw as many comics as he does. 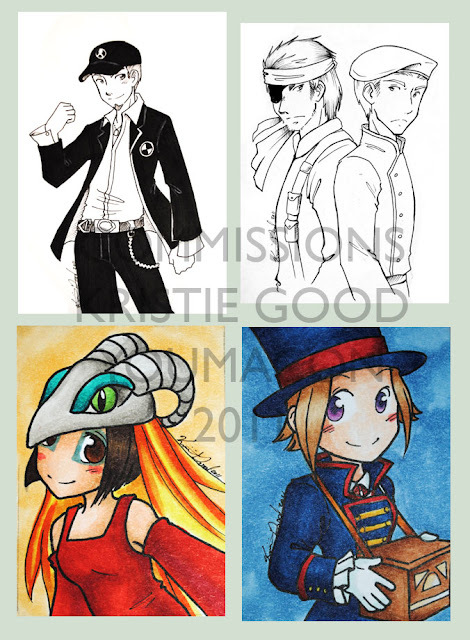 Some of my commissions throughout the weekend! The 4th floor elevators were working again! Huzzah! So we easily got to the car, and headed home. Where we sat on the couch and fell asleep. Wow what a con. It was chock full of people - I'd believe the reports of 12,000 if they're true. There were so many people I could barely leave my booth when I was there Saturday through Sunday. You guys really helped lift my spirits as an artist. Thank you all for stopping by and I plan to see you again next year! This pretty much sums up my weekend. Actual "report" coming later. :P I need time to recover. You guys WORE US OUT. 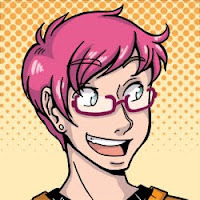 Convention Advice: What Should I Pack When Attending a Convention? What Should I Pack When Attending a Convention? Having been to way too many conventions in my lifetime (and many more to follow, I'm sure!) packing is almost a robotic exercise for Dave and me. Make the list, pack the bag, pack the car, go. Packing (and surviving a convention) is partially an art form and partially an exercise in camping training. Not that I'd ever go camping. Conventioning is hard enough! (Not to mention being too busy to use things like hot tubs or pools while I'm there). For those who are slightly new to the scene, or perhaps complete beginners, it's wise to learn what you should be aware of when packing along with some suggestions on what to pack. So let's get this party started, shall we? You will forget at least ONE thing. Yes. Let's just be up front now. You WILL think you have everything, and you WILL leave one item of moderate importance (or higher) at home. Try not to sweat it. It happens to all of us, and if you spend your entire convention weekend moaning about how you forgot your toothbrush, you're missing the point of having fun. It's also wise to note that most often you will leave toiletries or small clothing items at home. These things are easily remedied. I've forgotten hair brushes, shampoo, shaving blades, pajamas, normal pants.... You're not alone. We all do this. And luckily if you've forgotten something like shampoo, your hotel concierge should have little trial sized bottles for you to use instead. They have a lot of things like that. Cosplayers, pay attention. This counts for you too. Everybody needs to bring changes of clothing. I bring enough for one extra set of clothing more than the number of days I will be away. Gone for 3 days? Bring 4 shirts. Gone for 4 days? Bring 5 shirts. Why? Well, it's a convention. It's full of people and their messes, it's hot, confined sometimes, you're clumsy perhaps, the list could go on. You may need to change out of a super sweaty shirt after doing DDR for 3 hours. No, I take that back. You WILL need to change out of a super sweaty shirt after doing DDR for 3 hours. Please. None of us want to smell you. Swimsuit: bring one anyway. Even if the website doesn't say there's a pool, I've had them lie to me before. Large Bag / Cloth Bag: To keep your dirty laundry in and separate from the clean in your suitcase. Yeah. It looks like a lot - but you'll be doing plenty of walking, perusing, and the like. Cosplayers - yes, you should bring these too unless you plan on wearing that Sephiroth getup until you need to sleep. These are those everyday things you use that you hardly think about, but when you're without them, you FREAK. OUT. This is really just a reminder of things you'll want to have on hand to keep you clean and fresh! Shampoo/Conditioner - Trial sizes are big enough. bring a couple. Along with any other extra items you need for things like: contact lenses, hair dryers and the like. Everybody's got different needs. You ask why I'm so adamant about deodorant? Two words: Convention Funk. That awful body-odor smell that gets caught in hallways and panel rooms. The more caution you take (and more showers you take) the fresher, and better smelling you'll be. Now's where it gets kinda "up to you". I can tell you all the things I bring with me, and why, but they may not be the same things you'll need. Are you driving there? Best to make sure you've got your route and a map of the nearby area. Google maps can help with this immensely. If you have AAA membership - you can pick up maps of any state you want! And travel books! USE THEM. There's no excuse for getting lost if you have the capabilities of preventing it ahead of time. You will get hungry. And let me tell you after about 4 Subway subs, they start to look REALLY bland. Even if you pick different ones. 2-day conventions you'll just want to bring light snacks, but for those cons where you're traveling 4-5 days (including arrival and departure) you should think about bringing a cooler/box of some kind. Ramen cupsBread + Sandwich making materials (like peanut butter - if you have a cooler you can bring meat like salami, just remember it requires a bit of upkeep to make sure it stays cold). It sounds like a lot, but don't worry - they actually don't take up a lot of space. You are mainly looking for quick "lunch items" or small individually wrapped items you can carry easily with yourself. If you are traveling with other people - try to coordinate food with everybody! Then it's like a party! You will want to have a bag you can carry with you around the conventions. Something like a backpack or messenger bag. Not too big, but not so small you can't put anything into it. Everybody at a con will have their own "purse". Often conventions will give you a swag bag to start with - but if you set it down accidentally and forget it, you now have lost a bag that looks like everybody else's. Also having your own personal satchel/bag means you're more inclined to keep an eye on it. WORD OF CAUTION: Do not overfill your bag. It will hurt after carrying for more than a couple hours. But I'm at a convention! Why do I need to entertain myself?! Well I'LL tell you why: QUEUE LINES. I don't care how big or small your con is. It is inevitable you will have to wait in line for something. So instead of reading through the program for the millionth time, have something to pass the time: a novel, comic, sketchbook, handheld entertainment system of your choice, etc. You might be waiting 5 minutes, you might be waiting hours. (ACEN linecon - I'm looking at you). Besides, if somebody sees you doing something they like too, you could get a new friend! Or a videogame buddy. 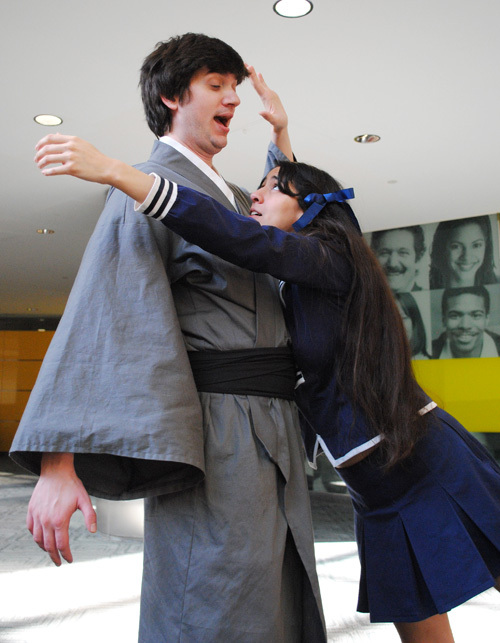 There are lots of other things you can bring - especially if you're a cosplayer, but I won't go into that right here. That's a post all on it's own. If I forgot any of the basics, let me know, I'll add em in! 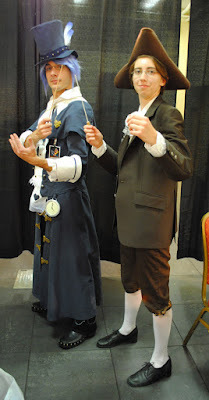 Convention Advice: What Exactly Goes On at a Convention? WHAT EXACTLY GOES ON AT A CONVENTION? Also Known As: "What will I do to keep busy? or "Is this show worth my hard-earned money?" "Hi, I've never been to a convention before. Can anybody tell me what goes on at a convention? Like, in great detail? I want to make sure I'm going to the right place. Kthxbai." After I've stopped twitching after reading this post for the umpteenth billionth time, I sit back and go, "Hey somebody should just list out general things that actually happen at anime cons! Would make the world like 10 TIME NICER". So I'll do just that. Right here. For you all. If I miss anything PLEASE PLEASE let me know! I'd love to have a comprehensive list of activities at conventions. There are a lot of things that happen at conventions, and the reason why this question makes me twitch is because the response post would have to be like 3 pages long. So let's start with the list! Ahhh the dealer hall. This is a place where professional vendors, shops, and the like are able to present and sell their wares. Think of it like a mini version of a mall full of anime, video game, and Japanese-inspired memorabilia. You'll see anything from DVDs and Manga, to artbooks, clothing, costumes, wigs, figures (large, small, popular, obscure), props, wallscrolls, posters, and egads so much more. Depending on the size of the convention, the dealer hall might be a huge arena or it could be one large banquet room at a hotel. I've been to both kinds. Many people come to conventions with the intention of spending money. They usually do it here. 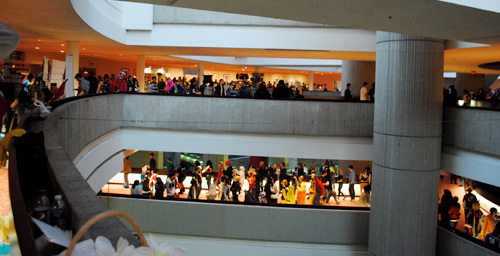 The dealer hall is usually a place of bustling activity regardless of the size, and typically is only open until about 6 or 7 pm. If you are looking for official items from your favorite shows or books, this is the place to do it. Artist's Alley is kind of like a smaller, homemade version of the dealer hall. Here you will find all of the individual artists who enjoy anime, manga, videogames and more and have taken up the call to be their own shop. Artists will have all sorts of random things you can't find anywhere else. There are traditional and digital artists, selling prints or taking commission requests, they'll have buttons, cell phone charms, various jewelry and gear and they can even have pillows, scarves, sculpture, bead sprites and the like. Artist's Alley is a place where anything is possible to find - sometimes you'll find really obscure characters or items that you'd never be able to find in the dealer hall, or you could have somebody draw your favorite Original Character for a fee. A lot of congoers forget this Alley exists. I say take a gander through it - you never know what you'll find. This is the main bulk of entertainment and keeping yourself busy at a convention. A panel is like a short 1-2 hour "class". 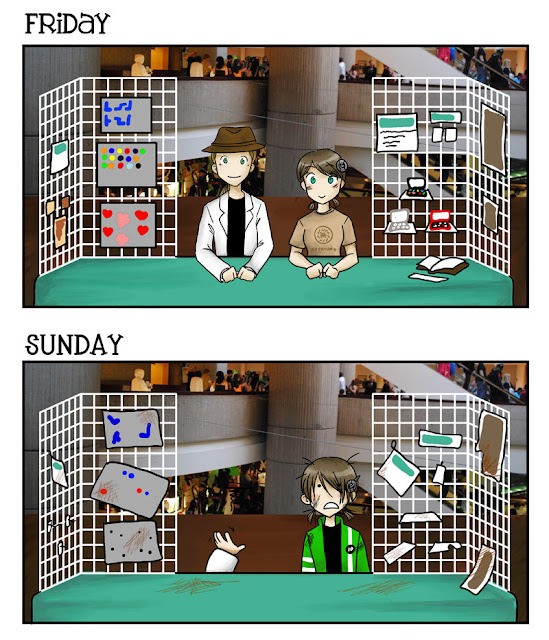 There are, of course, variants on what types of panels there are at a convention. The "Fan Panel" is usually a one hour session discussing a particular show, movie, genre, and the like. The presenter will go over the concept of what the show/movie/genre is and then go more in depth. These panels can range anywhere from "What is Hetalia" to "The innerworkings of Shinji's Mind". As you can see, you can usually spot one of these panels if it talks about "How To" something. 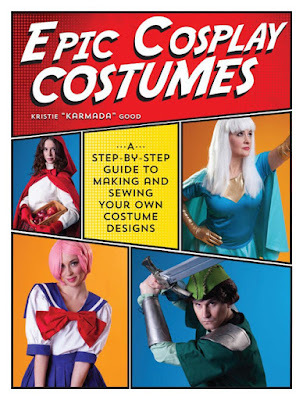 I actually learned a lot about cosplay from these kinds of panels. I've found these more common at shows like Gencon where it's more a collection of creative minds and energy as opposed to fan celebration Anime Cons tend to be (neither is superior, both have ups and downs). They will contain 2-5 people up at the front of the room, and instead of a lecture they will discuss topics (usually prompted by questions from the crowd or general emcee). Attendees can get advice, humorous stories, and general information from these panels. Some panels like to play games - literally! These types of panels will feature audience participation and have things like trivia or games that require eye hand coordination. Prizes are sometimes given, and really they're there to have a good time. Some panels like this I've seen/heard of: Anime Jeopardy, Anime Pictionary, Name that Theme Song, Mario Party, and a bunch more I can't remember at this time. Workshops are a lot like Informative / Classroom panels, except usually these have you making something AT the panel. They will run longer than 1 hour - I've seen some up to 3 hours long. You'll learn how to make something, and with materials provided, you'll get to make it too, and take it with you. NOTE: these panels often have a supply fee. Looking for the thrill of competition? Well you can do that at conventions. There are two major types of competitions that I've seen at shows - Masquerade/Cosplay and Game Tournaments. 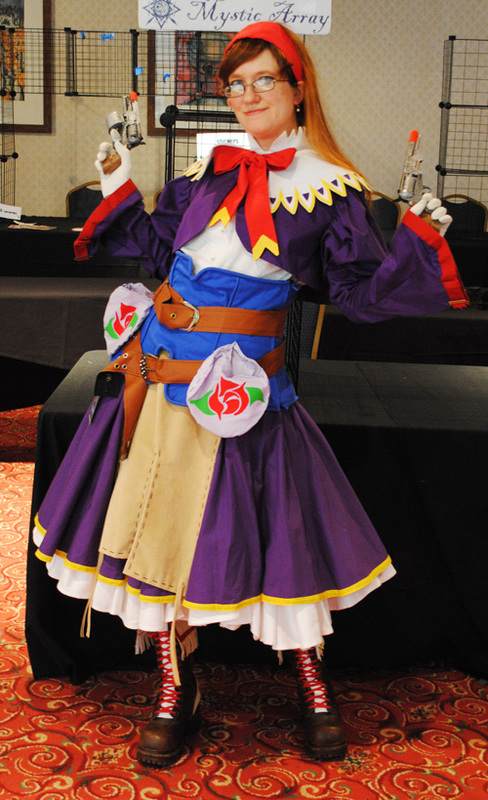 The Masquerade is a judge costume competition where cosplayers work hard and fight to win one of the shows coveted trophies. Nowadays, most judging is done before the actual "Stage Competition", and there are craftsmanship and performance categories. Craftsmanship competition will focus on the technical skill of creating a costume. Performance will focus on what a single or group of cosplayers do on stage. All of these are shown at the "Masquerade" where you'll see the performances in action, the craftsmanships strut their stuff on stage, and see who wins the trophies for that year! One of the most anticipated events of a lot of conventions. Only some of the conventions I've been to have hosted videogame tournaments. It's something I'm not very familiar with, but I hear Smash Brothers, Soul Calibur, and Marvel vs Capcom tend to be favorites right now. Maybe even some Blaze Blue. This is an area I'm relatively unfamiliar with, but a lot of conventions will have a "gaming" area. It's usually a big room filled with arcade machines, consoles, and electronic games that an attendee can enter the room and play to their hearts delight! Sometimes playing might cost money, but from my understanding it's set up so you don't have to. NOTE: This does not count things like Battletech pods. Those are separate items which cost money to do. For both cosplayers, congoers, and photographers, conventions will help set up and organize "Photoshoot Gatherings." 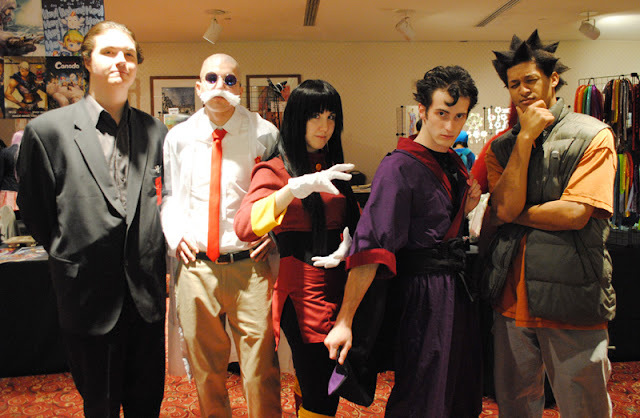 These are designated times and places that a group of people who are dressed in cosplay of a particular artist, show, or whatever will get together, and can get pictures taken of them en masse. If you're looking for pictures of only certain things, photoshoots are GREAT places to get this done. You'll also get to see people typically interacting as their characters, and let me tell you - it makes for some great hilarity. 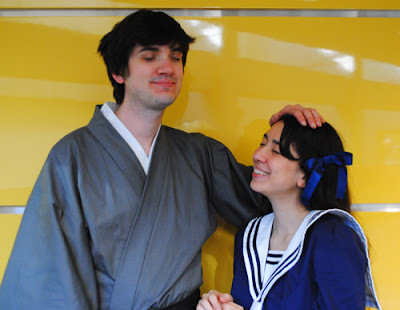 Cosplayers - it's a great place to meet people who like the same things you do! Same thing for those who aren't dressed, but really like the subject/show/artist. It's a great way to meet people. There's been an uptick in various types of entertainment you can see at conventions. Often there will be dances (see entry below), but there will also be concerts, the masquerade, comedians and more. The Masquerade is usually the "costume competition" where you will be presented with all of the entries for competition, sometimes a small half-time show, and then award presentations. There are also the finalists in Anime Music Videos that are usually shown at certain times, as well as the finalists of Game Tournaments. Other than that, there are usually a few rooms dedicated to showing movies, shows, fansubs, or what have you that relate to the convention - so if you're tired of learning/walking/whatever, you can find a room with something you'd want to see, and take a seat and rest. Mmm. Dances. *gets out old man cane. Sits on porch* Dances at conventions and I have not gotten along very well lately. BUT I DIGRESS. There are usually two types of dances held at conventions - there is a masked/formal ball, and a technopop dance (I refuse to call them raves, out of courtesy for the people who attend them). The formal ball is a dance where you'll have instrumental (be it live or pre-recorded), and some soundtrack music from games and shows. The dress code is obviously formal, but nice cosplays count too. It's a great way to spend an evening elegantly. It's also fun when you know or meet somebody who can teach you how to dance things like waltzes. Good times. The ...um... "Technopop" dance (for lack of a better term), is another dance that's held but features more techno, beat, remixes and such. Often attendees will wear neon-colored clothing, rainbow clothing, anything made from a glowstick, etc. They are also usually referred to as "The Rave". I don't go to these, so I can't really give you many details. If you do go, please, post here, or drop me an email or something. Have any other events you attend at conventions? POST HERE! I'd love to add it to my list. I hope everybody had a safe and fun halloween! 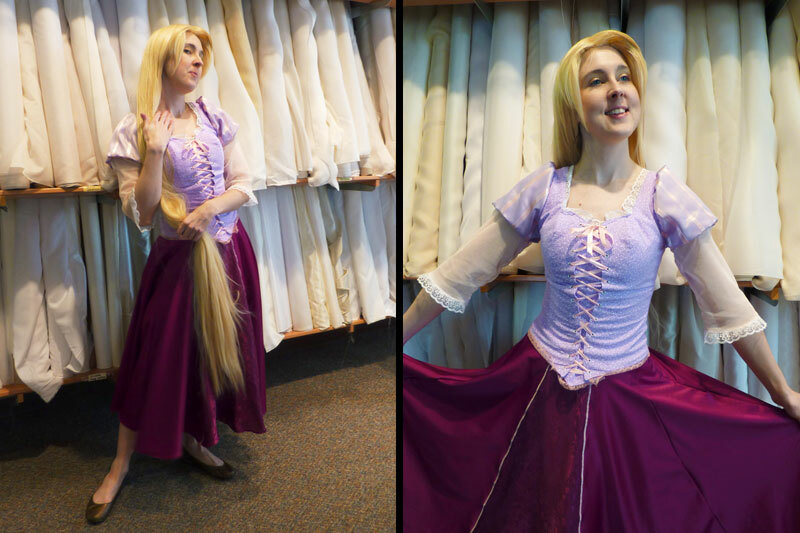 I got to dress up as Rapunzel at work! Making this costume in like, 2 days - while working on a commission at the same time = NOT SMART. I'd give you the story right now, buuuuuuut, I don't really have the time. So! Enjoy the pictures! Also learned a lot about cutting out satin. It's a letter away from satan for a reason. Skirt turned out a lot nicer than I had thought. It seems more satin may be in my future.